Breakpoints and the current line are now shown by (differently shaped) markers in the gutter, rather than changing the background colour of the line(s), which should be far friendlier for everyone, especially people who are colour-blind. Added a popup menu within the source viewer to provide another way to run to the cursor and toggle breakpoints. Tooltips now work (mostly) when hovering over variable names in the source viewer. Added the breakpoint pane to the main interface. At present, it supports function call and return and exception breakpoints, plus the usual file/line based ones set within the source viewer. Watch breakpoints are to get a different interface. Come up with a better name than wxDBGp. Suggestions welcome. An icon might be a good idea, too. Figure out some wacky method for making tooltips work in the call stack and properties panes, since mouse motion events don’t seem to be emitted after the pointer initially enters wxListBox and wxTreeCtrl controls. Add a watchlist pane (it’s going between Output and Breakpoints ). Add an options dialog to expose the configuration options, along with the ability to save the current pane layout as the default. Blackmail one of my more graphically gifted acquaintances into doing some better toolbar icons. 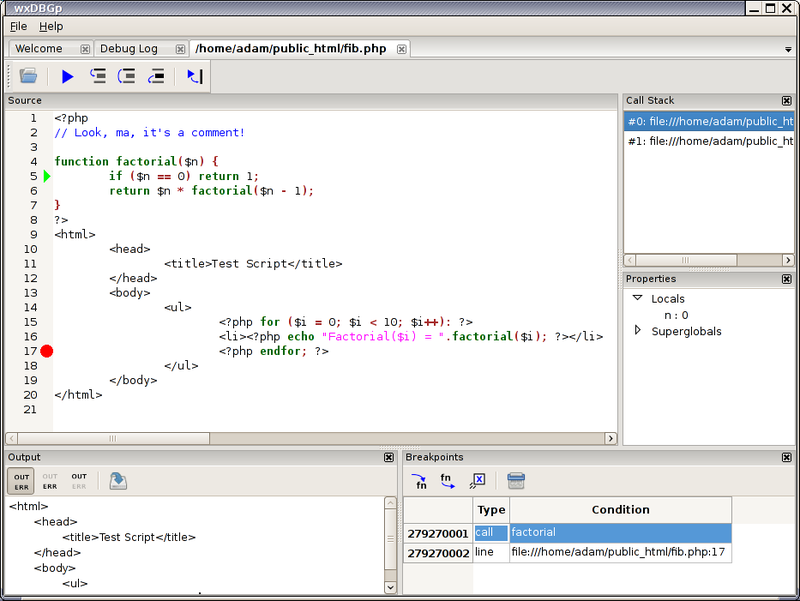 Add syntax highlighting support for more languages than PHP. 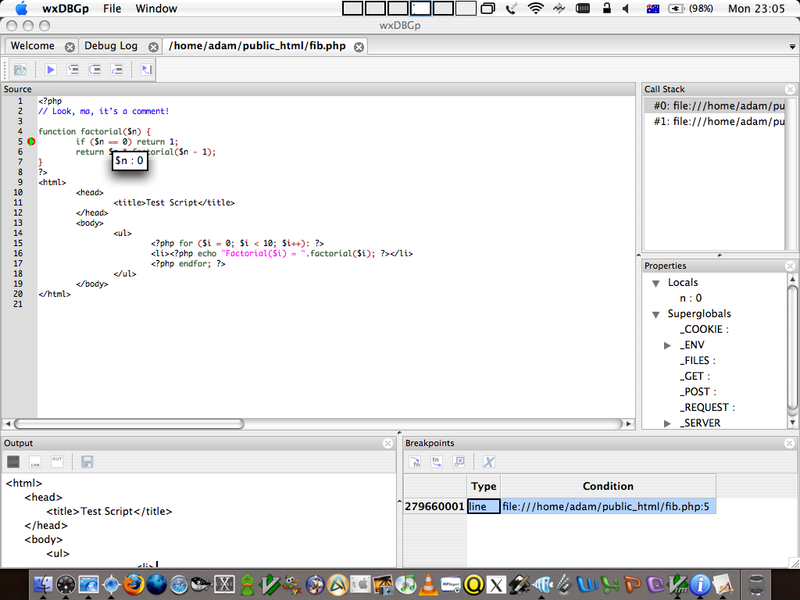 Syntax highlighting now works. Mostly. For PHP, anyway, since I haven’t wired up the other wxSTC lexers yet with style rules. No Windows screenshot this time. This is far, far better, as proprietary operating systems go. There’s a few graphical glitches, particularly in the toolbars (the alpha blending doesn’t appear to be actual alpha blending, for one), but it works entirely better than I expected, given that I’ve put very little work into a Mac version thus far. From here, I guess the remaining work will be done in minutes stolen here and there from uni assignments, but I’m confident it’ll be released — nay, unleashed — upon an unsuspecting world before the final date of August 20. This entry was posted on Monday, July 30th, 2007 at 23:31	and is filed under GSoC, PHP, Tech Geekery, WTF University. You can follow any responses to this entry through the RSS 2.0 feed. Both comments and pings are currently closed. Damn when can I get my hands on a copy to play with.